"Breakfast: The Most Important Meal of the Day for Rosebud Elders"
This is not just another story about how breakfast is the most important meal of the day. It’s about how one volunteer is getting breakfast to Elders of the Rosebud Reservation in South Dakota. Sure, a healthy morning meal helps the heart by “breaking the fasting period” from the prior night. And yes, skipping breakfast actually increases the risk of heart attack for men and may contribute to obesity, high blood pressure, high cholesterol and diabetes, which can add up to a heart attack over time. Mona Swimmer who works for the Rosebud Sioux Tribe Caregivers Program certainly knows this — it’s why she is a champion of healthy Elders and volunteers in a one-of-a-kind breakfast service for Elders of the Rosebud Reservation. 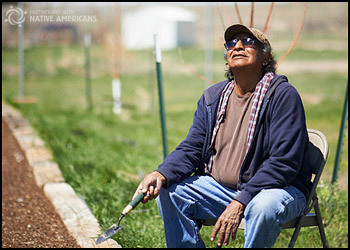 Through the Breakfast-in-a-Bag service from NPRA, a program of Partnership with Native Americans, Mona ensures the 581 Elders of Rosebud have a way to not run out of healthy breakfast food — even when their fixed incomes run out before the end of the month. She knows that 180 of her Elders live alone, that 20% of them are over 80 years old, that 74 of them are Veterans, that half of them have diabetes, that 35% of them live 20 to 40 miles from the nearest grocery store and that neighbors are remote and transportation limited. By volunteering with NPRA and PWNA, Mona ensures that more than 4,200 bags of groceries make their way into the Elders’ homes. Each bag is chocked full of eggs, oatmeal, milk, potatoes, cereal, meats, bread, juice and bananas healthy foods from warm hearts. We congratulate Mona, who was recently recognized by the Rosebud Sioux Tribe for 30 years of dedicated service. She truly cares about the elderly and we appreciate that she has spent her life helping them. Photo Courtesy Partnership with Native Americans(PWNA) * All Rights Reserved.